Many other salesman knock our door to persuade us to switch to other suppliers. 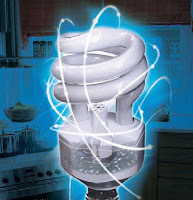 But if I keeps receiving those light bulbs, we think about if it's wise to switch our suppliers, and may ask the salesman this question: do you give us free energy saving light bulbs as British Gas does? As we a bag of salt into the sea will not increase the sea saltier, four light bulbs have no way to compromise British Gas's profit, because "It's the little things that are easy to do - the little steps that add up to a lot." says BG managing director. It would be a disaster if all BG customer turn "totally green overnight". But this not going to happen, four light bulbs just like a bag of salt to the ocean, and do the same job a carrot to a donkey, which let it's customer loyal to BG. What an interesting marketing ploy.